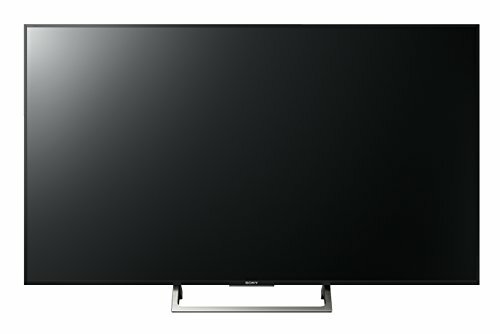 After struggling to impress with its mid-range TVs for the past couple of years, Sony has turned things round handsomely with the 55XE8596. With Sony mostly smashing it out of the park this year with its high-end TVs - the A1 and XE90 being obvious examples - hopes have to be high that a healthy dollop of such quality will have filtered down to more affordable Sony models such as the XE85 model reviewed here. In fact, if this 55-inch model can combine its eye-catchingly aggressive £1,099 price with even a flavour of Sony's 2017 picture quality talents, it has the potential to be one of the season's biggest AV bargains. But does it hold up? From a sensible viewing distance the 55XE8596 looks attractive for such an affordable set. The black frame (silver is also available) around the screen is remarkably slim, the rear is fairly sleek too, and the whole thing seems to float on a barely-there rectangular "open frame" desktop stand. While setting up the 55XE8596, though, we couldn't help but notice that build quality is a bit flimsy, featuring more plastic than metal. The open frame stand even flexes and bends under its own weight until it's fixed in place. The completed TV does still feel stable enough, however, to withstand all but the most strenuous destructive efforts of large pets and children. The XE85 doesn't sit quite high up enough in Sony's current TV range to get the brand's latest and greatest X1 Extreme processing chip. It does get Sony's previous X1 4K HDR chip, though, and this still offers some great features. It drives Sony's renowned Triluminos colour system, for instance, which continues to deliver some of the most dynamic and finely tuned colours in the TV world. It also carries a database of Sony picture knowledge that the 55XE8596 can draw upon to deliver better on-the-fly upscaling for non-4K sources, from video streams to HD Blu-rays and broadcasts. Digging a little deeper into formats, the XE85's 4K screen can handle both the industry standard HDR10 and new broadcast-friendly Hybrid Log Gamma (HLG). There's no support for the HDR10+ system recently delivered by Samsung (and set to be supported by Amazon), and there's no support for the advanced Dolby Vision HDR platform. Dolby Vision only kicks in with Sony's 2017 TV range from the XE9305 series up. The XE85's 55-inch screen is lit by an edge LED lighting system with no local dimming. This doesn't sound like a particularly promising light setup for a High Dynamic Range (HDR) TV, but thankfully Sony has gone back to more contrast-friendly VA LCD panel technology for its 2017 8-series following an ill-fated move to IPS panels for last year's equivalent models. When it comes to peak brightness, however, the XE85's output is around one third as bright as some of this year's flagship LCD TVs. Its 450 nits just doesn't deliver an explosive HDR image, but it does help the TV keep a lid on the sort of backlight flaws edge-lit HDR LCD TVs so often suffer. Dark HDR scenes suffer much less with the low-contrast grey misting typically associated with edge LED TVs. Even better, there's impressively little interference from the sort of backlight clouding and banding issues usually associated with HDR playback on edge LED TVs. However, the lightest parts of HDR content don't pop or stand out so starkly against darker elements as they do with more potent HDR TVs, and exterior shots and skies don't enjoy the same sort of life-like intensity. None of this means that the 55XE8596 doesn't deliver some benefit from HDR, though. In fact, given the brightness limitation, the XE85 offers arguably the best black level performance you can get from such an affordable set. Screens that don't have much brightness to work with can lose detail in the brightest areas of HDR images. The 55XE8596's tone mapping system, though, is clever enough to make sure that peak HDR areas avoid that tell-tale empty, flared out look you see with less able, brightness-challenged TVs. Overall colours look excellent: blends and skin tones are delivered with exceptional subtlety for such an affordable TV, unlocking the potential of the screen's native 4K resolution and helping to paint a richer, more three dimensional picture world. Actually, detailing in general is exceptional with the XE85 - especially as its colour and tone mapping talents are joined by the TV world's finest motion handling system, Motionflow. Use this on its Clear and True Cinema settings to reduce judder and blur without having to worry about the image becoming unnaturally fluid, or the processing causing unwanted processing side effects. Being able to handle motion effectively is particularly important with 4K TVs, and is another clear way in which the 55XE8596 stands out against its similarly priced competition. The XE85's pictures even manage to look sharper than usual when you're watching HD rather than 4K sources, thanks to the excellent upscaling efforts of Sony's X1 processor. Sony's database approach does a stand-out job of identifying and removing image noise before embarking on the arduous process of adding millions of extra pixels to the HD source. Sony KD-55XE8596 review: Great for gaming? The 55XE8596's contrast, motion, colour and clarity prowess makes a great gaming screen too. Image lag is no issue, averaging 21ms and only rarely slipping to a less satisfactory 50ms in some setup scenarios. As noted earlier, the XE85 uses a VA LCD panel. While this delivers key contrast advantages, it does also have one weakness: limited viewing angles. You only have to sit at an angle of around 20 degrees or so for contrast and colour saturations to start reducing rapidly. Something to bear in mind if your room layout means someone in your household routinely has to sit at a fairly severe angle to the TV. This limitation is hardly a rarity in the LCD world, though. Android TV is now less buggy and sluggish than it used to be. It supports a few more video-friendly apps than it did at launch, too. That still doesn't make it a great smart TV interface though. Its homepage still feels cluttered and the layout is poor. It still tries to dictate what it thinks you should be interested in rather than trying to figure out the sort of content you actually want to have prioritised. There's hardly any potential for personally customising the layout, and it seems to need far more data-heavy firmware updates than rival systems. It also lacks a few key UK apps, but fortunately Sony gets around this by adding the YouView platform, with its support for all of the big four UK terrestrial broadcast catch-up platforms. There are also 4K HDR-capable versions of Netflix and Amazon, plus Android TV's biggest selling point: integrated support for Google Cast. Lastly, there's sound, which is decent considering the XE85's asking price. Considering how little chassis there is to work with, the telly casts sound well beyond the confines of its frame, immersing you in a wide but well controlled wall of sound. There's depth as well as width to the soundstage, which helps the TV define an engaging sense of audio space for the images you're watching. There's not enough bass to really do action scenes justice, though, leaving them sounding a bit thin and harsh at times. But you couldn't reasonably expect anything else at this price point. After struggling to impress with its mid-range TVs for the past couple of years, Sony has turned things round handsomely with the XE85. Its picture quality is exceptionally good for such an affordable 55-inch TV, handling both standard and HDR sources with the sort of authority and panache that you'd normally expect to have to spend way more to get. Sure, it can't deliver the brightest output levels - but that helps it deliver a standout black level for this price point. Any brighter and its edge LED illumination would likely become a problem. Overall, the easy-on-the-eye design and Sony's considered move to use a higher-contrast panel than its 2016 models all adds up to an improved and impressive performance at this price point. If you can find another £300 or so, stepping up to Sony's 55XE9005 gives you a direct lighting system for an even more contrast rich picture, as well as a substantial step up in HDR-friendly brightness (it's almost twice as bright). The cheapest member of Samsung's new QLED family is actually one of the best, combining effective backlight controls with good brightness and colour volume to deliver a remarkably (for its money) complete HDR experience.